there is a full moon, a lunar eclipse, and a comet fly-by, all scheduled for the overnight hours, and i am missing the whole shebang on account of overcast skies. even with the current scientific understanding of such cosmic events, and the general acceptance of a little thing commonly referred to as coincidence, this much "cosmic" in one night leaves me wondering if the end is indeed nigh, because it kinda feels like that most days. 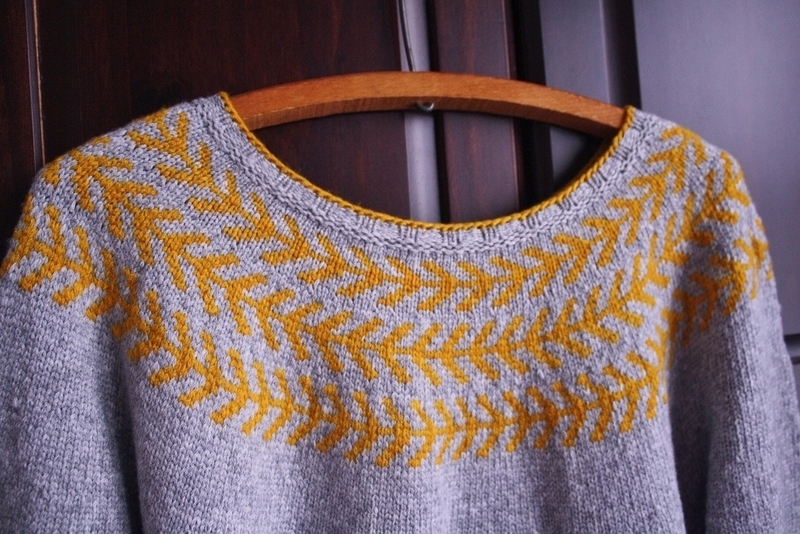 i finally mustered enough enthusiasm to take some photos of my latest finished object. 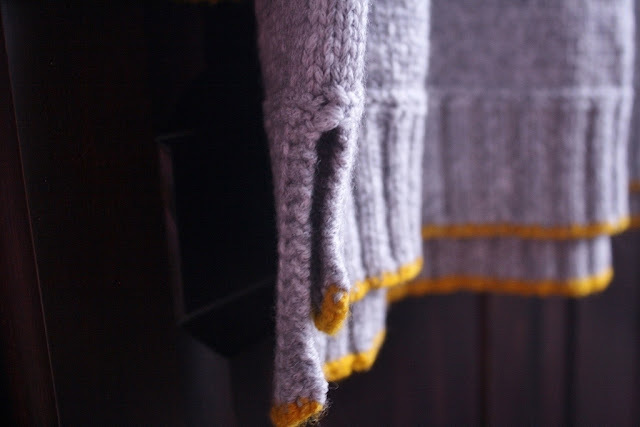 i started working on this sweater just before going to bed (at like nine p.m.) on New Year's Eve with the totally-arbitrary goal of having it done by the end of January. i was well on my way to making that happen, but i tossed the project aside for a week or so while i mourned the death of basic human decency. so, while it was finished a couple days later than intended, i am still over the (non-visible) moon with my new sweater. the pattern is the Branches & Bud Pullover by Carrie Bostick Hoge. 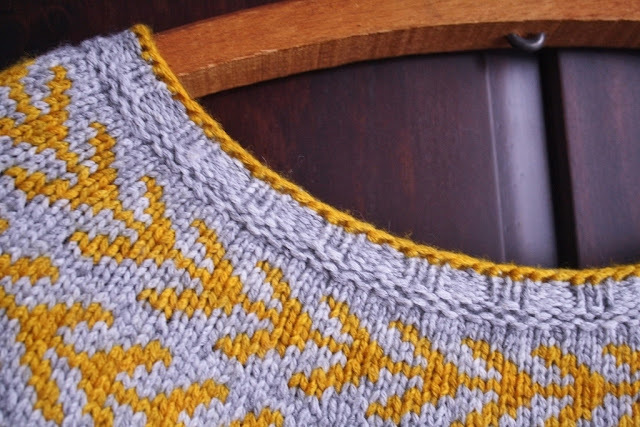 i have been salivating over this design ever since i first mentioned it way back in June, so it seemed appropriate to kick off a year of making things by finally making one of my very own. the plan was to use an off-white yarn for the contrast, similar to the original design. 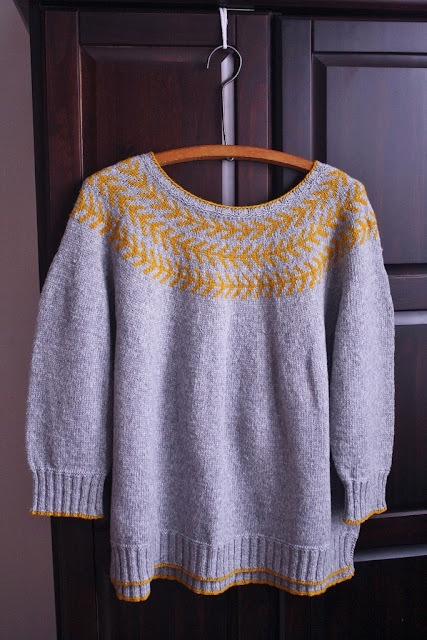 i almost never make anything in the same colors as the sample garment, but this particular yarn only came in a few colors (black, dark-grey, grey, beige, and off-white). 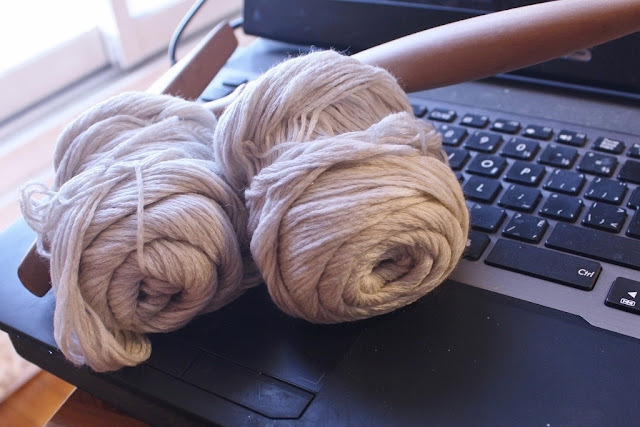 [this is the same yarn i used for the infamous squirrel cardi]. i had enough grey for the body of the garment, so the white seemed like the best contrast color. then things got complicated. 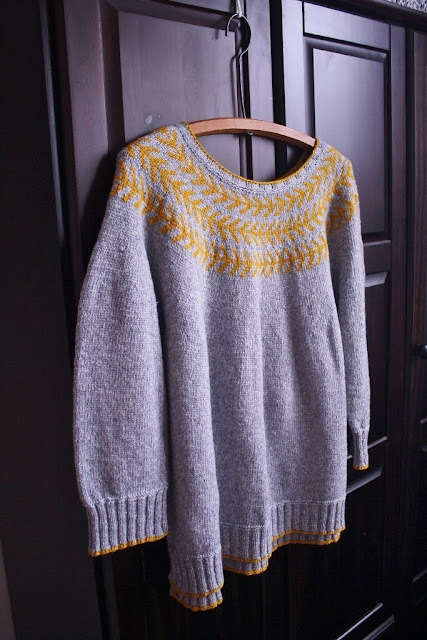 the sweater is knit from the top down (collar to hem), and i could not decide if i wanted to also use the contrast color for the collar edging or just stick with the grey. 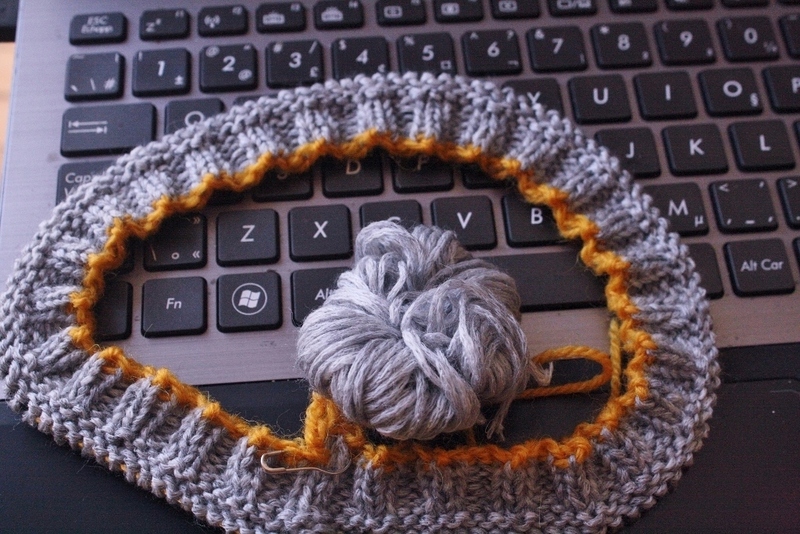 i casted on with a bit of gold scrap yarn, with the intent of removing that later and finishing the edge with either the white or grey yarn. 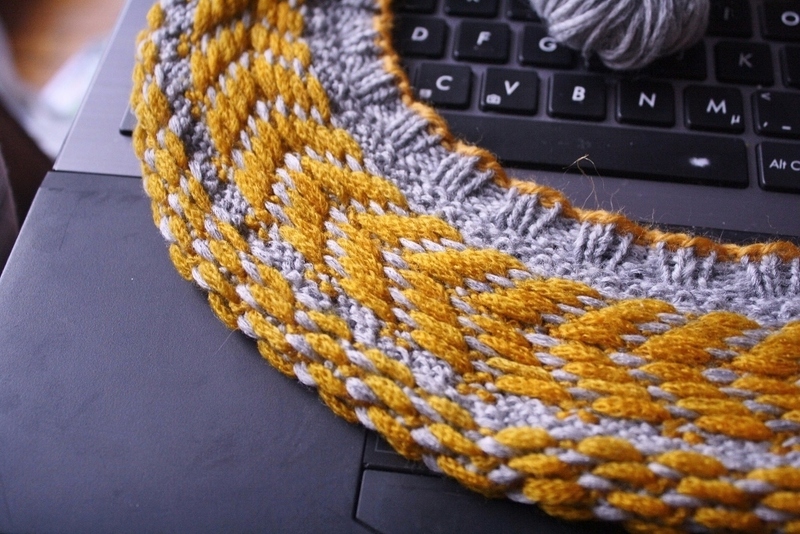 by the time i got through knitting the collar band, i was in love with the gold/grey combo. 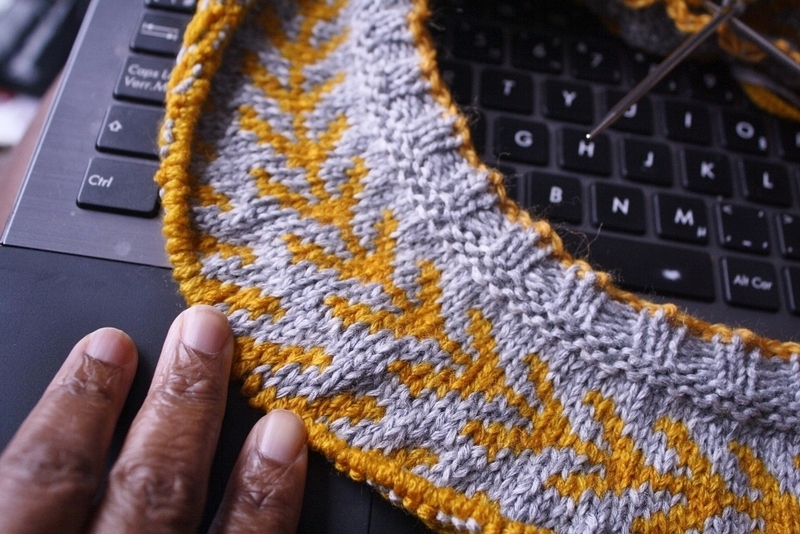 problem was, the gold scrap was some (super-scratchy) yarn left over from a pretty lace cardi i made eons ago for mom. i was not going to ruin my squishy goodness with scratchy yarn! where was i? 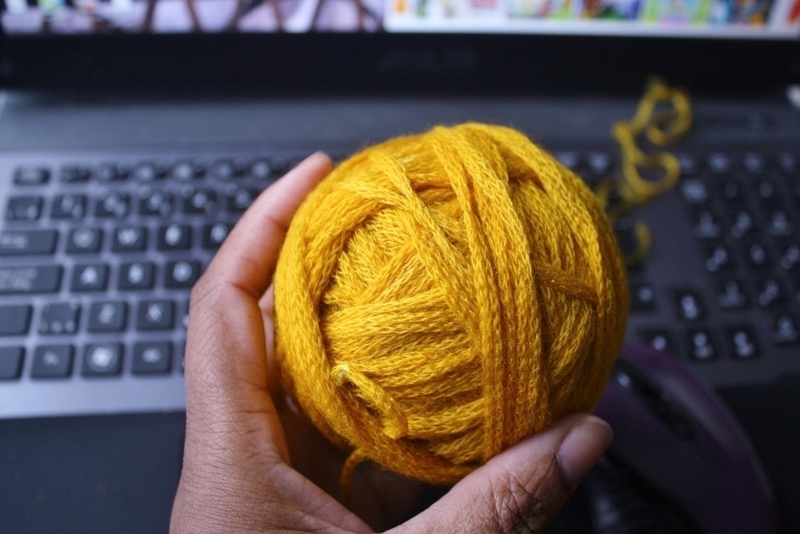 oh, yes... the quest for super-soft gold yarn! 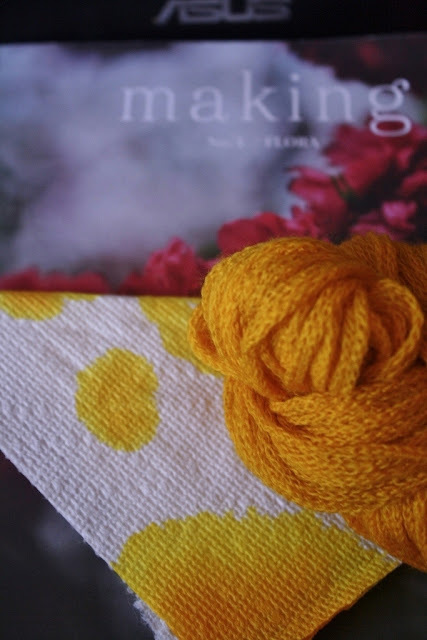 the recipe is actually a simple one: take the super-soft white yarn and add the desired shade of gold dye. simple! now, it should be noted that my favorite animator, a bona fide professional visual artist, is the single worst person on the planet to ever ask about the color of anything... ever! me: would you say that this was more ecru or camel? him: [after a quick glance] it's brown. that happens a lot around here. he did, however, prove most helpful in fine-tuning a gold that approximated the color i was after. to this... the perfect gold yarn. ta da!!! thank you... thank you very much! i kept the scratchy scrap yarn in place and moved on to the stranded colorwork that forms the "branches" part of the design. when done correctly, stranded colorwork can be as attractive on the inside as it is on the outside. and, yes... this does involve working with both colors of fiber at the same time (note: the yarn was too thin for this project, so i doubled it up, hence two strands of each color). 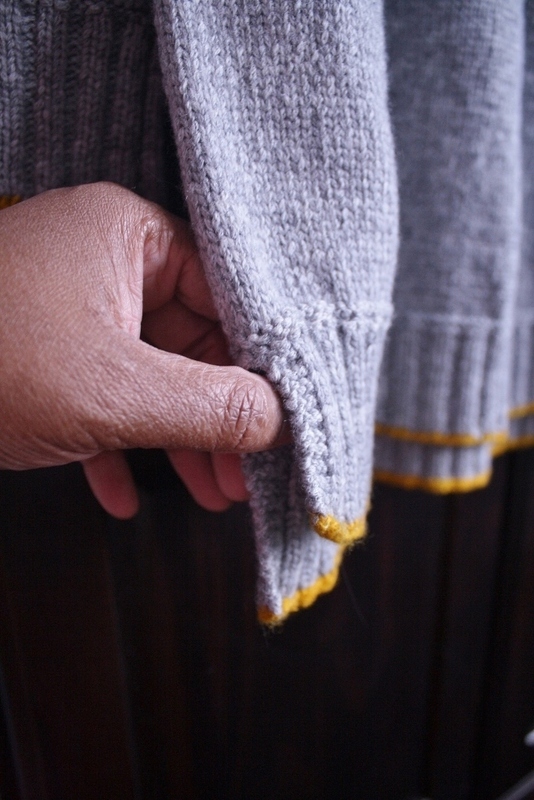 i decided to also use the contrast yarn to finish off the lower edges of the sweater. i shortened the sleeves to bracelet length and finished the cuffs with a splash of gold. ditto for the hem, where i made two additional minor adjustments to the pattern. i opted for a slightly longer hem in the back, and added a split along both sides for a better fit around my more-than-generous hips. i really like how neat that looks from the side. the last step was to remove the scratchy gold scrap yarn from the neckline, and replace it with the custom-dyed squishy goodness. so much squishy. so much goodness! 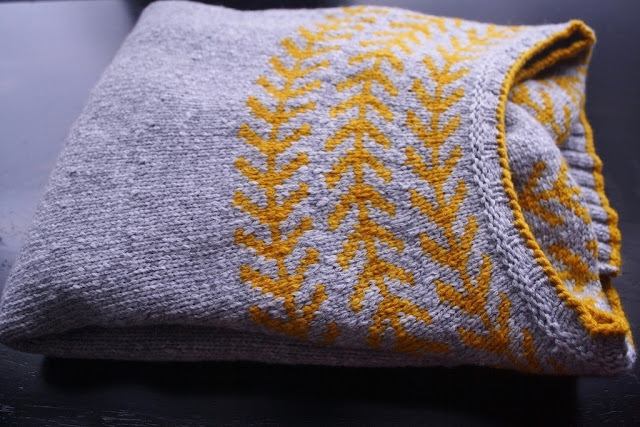 so, now i have a soft, squishy sweater that i (hopefully) will be able to wear for more than thirty seconds at a time (allergies are no joke, people), and i am already contemplating how to fill the newly-created space in my fiber stash. i may have to take a trip to the yarn shop. that is, if we make it through the night. 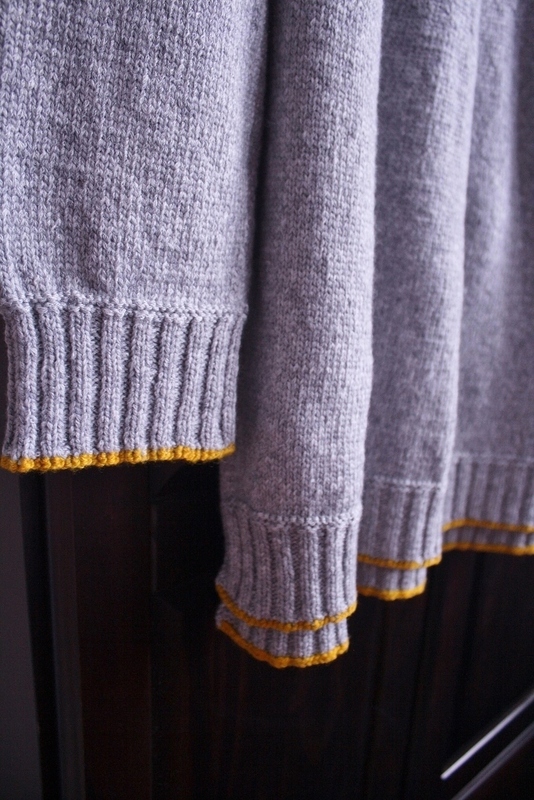 this is a beautiful sweater, and while I never would have thought of gold and grey together, it does indeed work here. I'd be tempted to wear this inside out, too. The inside looks at least as interesting as the outside. I have the same problem with my husband, I see reddish orange, he sees red. I see violet blue, he sees blue. Sigh. why, thank you! i have a habit of wearing my sweaters/sweatshirts inside out around the house, so this one will likely go the same way. 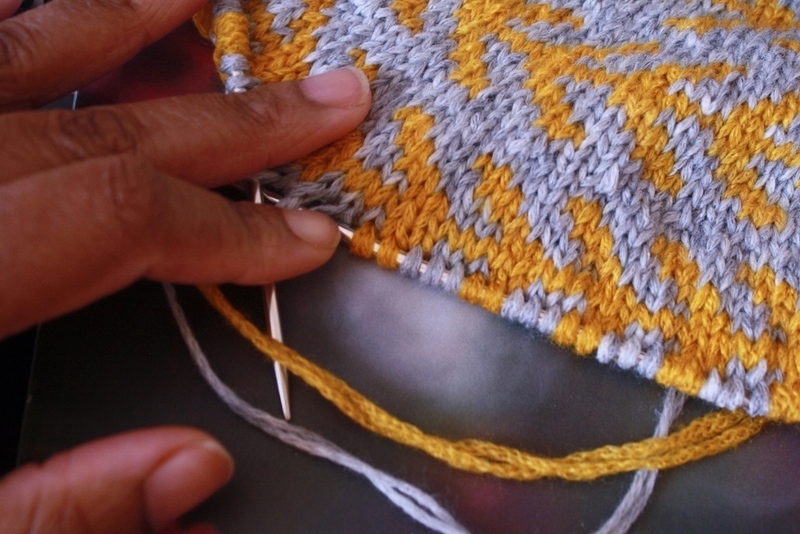 i was very neat when weaving in the ends for that reason. of course, with this wacky weather we're having, i may be in a tank top by the end of the week. gorgeous. love the color combo! thank you, nina. i usually live life in black/grey-scale, so any suggestion of color in my wardrobe is a welcome change.